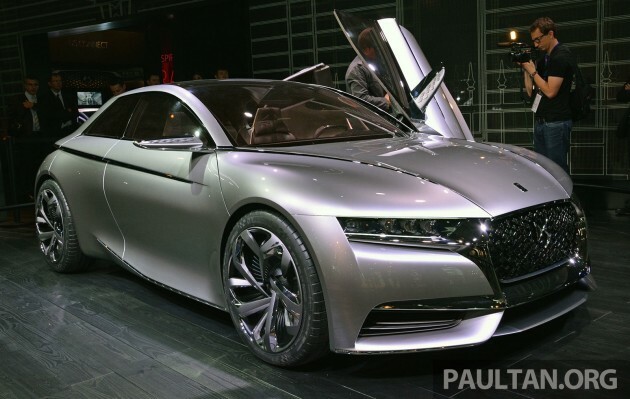 It’s not Paris Motor Show without a crazy concept from Citroen, and the French brand’s Divine DS is this year’s wild child. Described as a true expression of the DS brand’s DNA, the Divine DS is a four-door car that’s 4.21 m long and 1.98 m wide, putting it in the C-segment hatch ballpark. The wide front end of Divine DS features ‘wings’ that were first seen on the DS 5LS and DS 6WR. The radiator grille is a sea of floating diamond shapes of different sizes and in varying shades of chrome. More scales inside the four-seat cabin, which features work from Maison Lesage, France’s most prestigious embroidery house. There’s no rear window, so passengers can immerse themselves in an intimate, sophisticated cocoon, Citroen says. It’s not important in a exploratory styling concept, but the Divine DS is powered by a 1.6 THP engine with 270 hp and 330 Nm of torque. A mad reptile of a car that wouldn’t look out of place in an alien movie, sci-fi dreams of year 2114, or a next-gen shootout with the VW Scirocco R and Renault Megane RS. Paul Tan & crew, what is wrong with your website, it seems to be loading the mobile version all the time even on my computer & ipad, the whole website seems to have shrunk down to your mobile site version, I’ve tried ie & Mozilla, still the same, cleared the browser settings put only your website comes out like this, it started like beginning of this week. Can you all provide some info as I believe others have also alerted you all on this…very hard to read & view your site, please help, thanks. I’m also getting the mobile version on my iPad but not on my desktop but I remember as some point my iPhone managed to load the full website but its back to the mobile version for a good few weeks now. Can you guys share your User Agent from the affected devices?